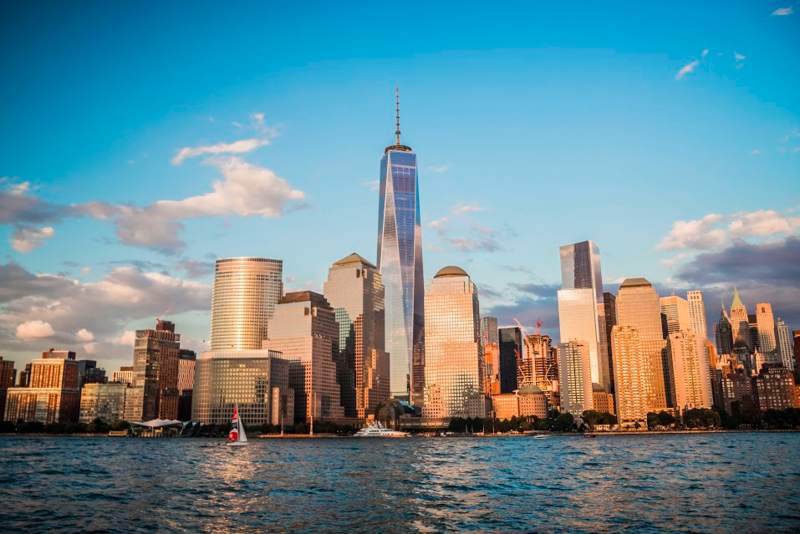 Take in the NYC Skyline with a Lower Manhattan Sightseeing Cruise departing from either our Chelsea Piers location or our North Cove Marina location. Come aboard any one of our yachts and experience a boat ride journey down the Hudson River and into NY Harbor. Along the way you will see the Statue of Liberty, the Financial District, Ellis Island, the Brooklyn Bridge and the most famous skyline in the world! 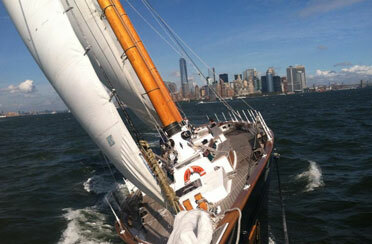 Whether you want to experience this by sail boat or motor yacht we have the perfect NY Harbor Cruise for you. 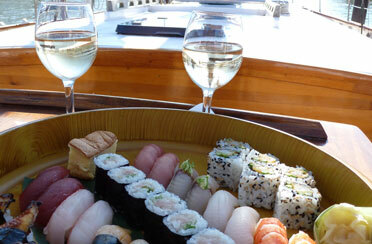 Our boat trips range from a Morimoto Sushi and Sake Sunset Sail to a and evening Jazz Cruise aboard a 105 foot schooner. Just want to get out in the sun and on the water for the afternoon? Jump aboard for one of our Day Sails or a classic Statue and Skyline Cruise. 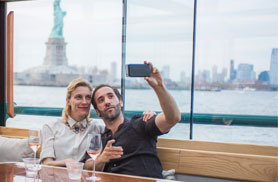 Whichever Lower Manhattan Sightseeing Cruise you pick, you are sure to have excellent photo opportunities of the major iconic landmarks or have the best backdrop for your selfie! Experience a New York Sightseeing cruise like never before. Step aboard our 1920s inspired motor yacht and take in the iconic sights that NY Harbor has to offer . Enjoy one complimentary beer, wine, champagne, soda on us. Additional drinks are available for purchase. 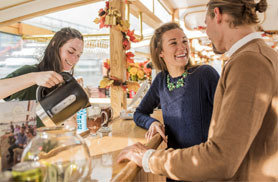 This is a wonderful cruise to treat out of town guests to see the sites and is a perfect sightseeing cruise for children as they are welcome to enjoy a kid-friendly version of our signature beverages. Sit back and relax on this elegantly crafted boat as you cruise by Ellis Island, the Statue of Liberty, Governors Island, and pass under the Brooklyn Bridge and the Manhattan Bridge! 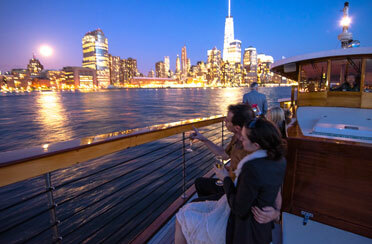 Experience a Romantic New York Sightseeing cruise like never before. Step aboard our luxurious 1920s inspired motor yacht. As you cozy up in the climate controlled observation cabin to take in the iconic sights, enjoy a complimentary drink. (Enjoy a complimentary beer, wine, champagne or soda on us. Cash bar available for additional drink purchases) Join us for a bright and beautiful New York City Skyline by nightfall during a comfortable and unique New York City Harbor Cruise. This romantic cruise is truly one of the most spectacular ways to see NYC! (Photo by Tali Blankfeld). In honor of our National Holiday Weekends, Classic Harbor Line and Turnstile Tours have teamed up to offer a special series of Naval Harbor History Tours! Join us on Memorial Day Weekend (and Fleet Week), for a special, in-depth tour of our rich harbor-related war history. This special 2.5-hour tour will explore the military history of New York Harbor from the Revolutionary War to today, with special emphasis on the role of the port in World War II. We will visit historic military sites, monuments, fortifications and see historic and modern fighting ships up close (especially during Fleet Week). Sit back and enjoy the luxurious view of the island from the cozy solarium or the open decks of our gorgeous, 1920s-style yachts! This is our shortest cruise and will take you out to the Statue of Liberty and back in 60 minutes! On this intimate excursion our Captain will narrate and highlight all the major iconic sights that NY Harbor has to offer. Cruise past the Financial District and take in the sight of the Freedom tower from the perspective of the water. 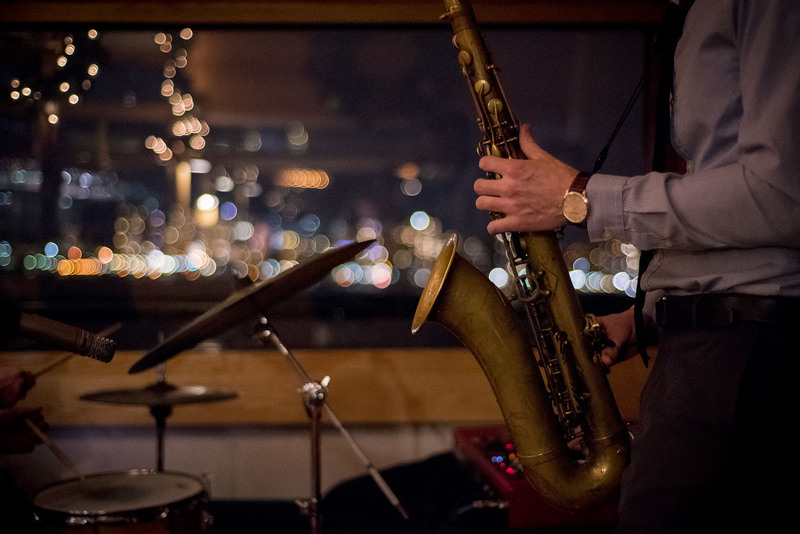 Cruise New York City’s famous harbor aboard the luxury 1920s style yacht Manhattan while listening to live jazz music by the Classic Harbor Line Jazz Trio, The Sound Waves! 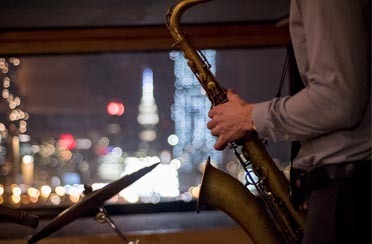 Learn more about our NYC Jazz Cruise! This is truly the perfect way to start your evening with sipping on some Champagne and relaxing to the soothing sound of the jazz. 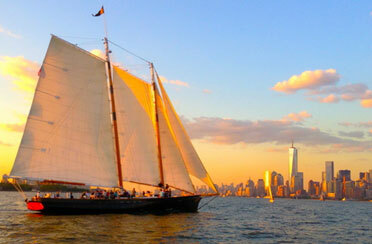 Board the 105-foot, 1800s styled, Schooner America 2.0 after dusk to take a tour of the unmatched Manhattan skyline. Bring your favorite companion or a group of friends to enjoy the lights as you sip on champagne in the peaceful late-night breezes of the Harbor. The City Lights sail on America 2.0 is an exquisite choice for an after-dinner event or to finish any day in the city. (Photo by Tali Blankfeld). Experience New York City lights like you never have on this sail past the bright and beautiful borough of Manhattan. You’ll take in the famous Manhattan skyline as it was meant to be seen — from the water. You will also enjoy spectacular views of Ellis Island, the Statue of Liberty, and the Brooklyn Bridge lit up by the evening lights. 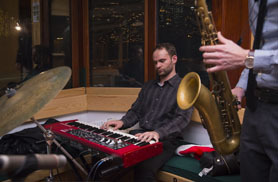 Join us for a magical evening of live jazz aboard the decks of our stunning 105 foot schooner. Sit back and relax with a glass of Champagne in hand and glide through the darkness of NY Harbor with the twinkling skyline as your backdrop. This sail is perfect for date night or a group of friends looking to do something unique. Celebrate World Pride Month with us and step aboard for an afternoon sail on one of our classic Schooners! 100% of net ticket sales goes to benefit transgender, non-binary, and gender non-conforming youth programs of the Hetrick-Martin Institute. So grab your friends, soak up the sun and sail with us through the waters we proudly call home. 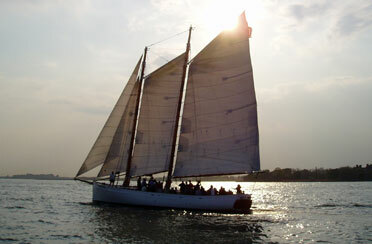 Enjoy a day sail on this 105-foot schooner that is perfect for family outings, dates, and entertaining. A sail on America 2.0 is guaranteed to be an unforgettable experience. Within five minutes of leaving the dock you’ll feel the relaxing breeze of New York Harbor; forgetting the mayhem and noise of Manhattan. 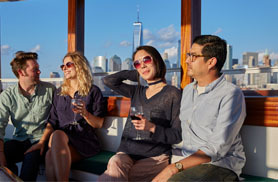 Experience a beautiful New York City sunset and the illuminated cityscape during a comfortable and unique NYC Harbor sunset cruise through the Hudson and East Rivers. Sit back and enjoy the gorgeous 360-degree view of the island from the open decks or the glass observatory of this Gatsby-esque 1920s style yacht. (Photo by Tali Blankfeld). 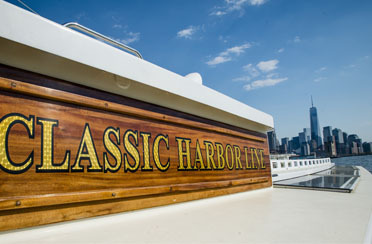 Enjoy Happy Hour aboard a classic yacht in NY Harbor just minutes after the end of your work day. Kick back and relax with friends & co-workers on this 60 minute cruise. 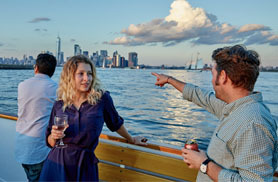 See the key NYC harbor sights aboard our intimate wooden yacht departing from North Cove Marina. This yacht is ideal for up to 40 guests, feature a full bar, comfortable seating and excellent views of the city skyline and New York harbor. Each excursion will feature a slow pass by the Statue of Liberty & Ellis Island. On occasion, at high tide, we may even circumnavigate the Liberty Island. See New York like you never have on this 2 hour sail aboard the Adirondack, a wooden 80-foot pilot schooner. Within five minutes of leaving the dock, you’ll forget the mayhem and noise of Manhattan street life, and you’ll feel the relaxing breeze of New York Harbor! 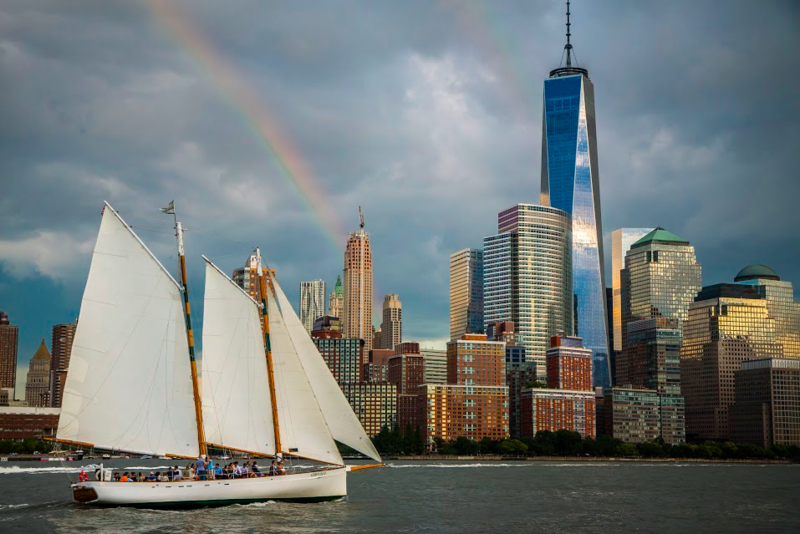 Experience the most stylish means of viewing a New York City sunset; sailing aboard the Schooner America 2.0. While sailing you will be treated to a glass of champagne by our exceptional crew as you watch the vibrant warm rays of the sun sink peacefully into the horizon. Step away from the hustle and bustle of the city with your favorite companions when you board this 105-foot, 1800s styled vessel, America 2.0. She’s perfect for romantic outings, entertaining friends from out of town, or just relaxing. 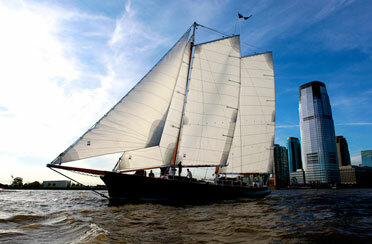 See New York City sunset from the water on this evening sightseeing sail of the borough’s waterside landmarks. Climb aboard our beautiful 80-foot schooner, the Adirondack, and join your captain in this peaceful, picturesque sail away from the concrete and noise of the city. (Photo by Tali Blankfeld). Join us for some afternoon sightseeing aboard our Statue and Skyline cruise departing from North Cove Marina on one of our classic yachts. In the heart of Battery Park City this is the perfect place to jump on a boat and head out into the Harbor to see the city from the waters perspective. View iconic sites such as the Statue of Liberty, One World Observatory, Ellis Island, Governors Island, the Brooklyn Bridge and more! See the key NYC harbor sights in just one hour aboard the smaller more intimate wooden yachts of the Classic Harbor Line fleet and depart from North Cove Marina. 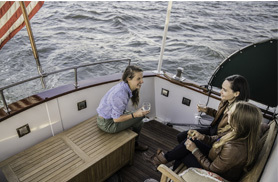 The yachts are ideal for up to 40 guests, feature full bars, comfortable seating and excellent views of the city skyline and New York harbor. Each excursion will feature a slow pass by the Statue of Liberty & Ellis Island. On occasion, at high tide, we may even circumnavigate the Liberty Island. This shorter cruise is ideal for families or tourists with limited time. Start your Saturday with an early afternoon Mimosa Cruise aboard the Yacht Kingston or Yacht Full Moon. 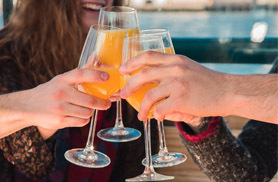 Cruise with us out into NY Harbor with a Mimosa in hand and take in all of the major iconic sites this city has to offer. This is the perfect way to start your day with a loved one, your family or a group of out of town guests. 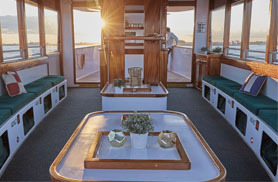 Step aboard one of the smaller more intimate wooden yachts of the Classic Harbor Line fleet and depart from North Cove Marina for a cruise in New York Harbor at Sunset. The yachts are ideal for up to 40 guests, feature full bars, comfortable seating and excellent views of the city skyline and New York harbor. Each excursion will feature a slow pass by the Statue of Liberty & Ellis Island. On occasion, at high tide, we may even circumnavigate the Liberty Island. 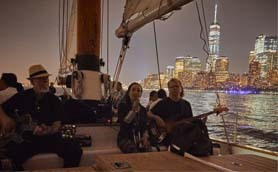 Join us for a magical, moonlit view of Manhattan aboard the Schooner Adirondack. On this sail, you will experience the splendor of New York City’s nighttime skyline under the bright, radiating moonlight. 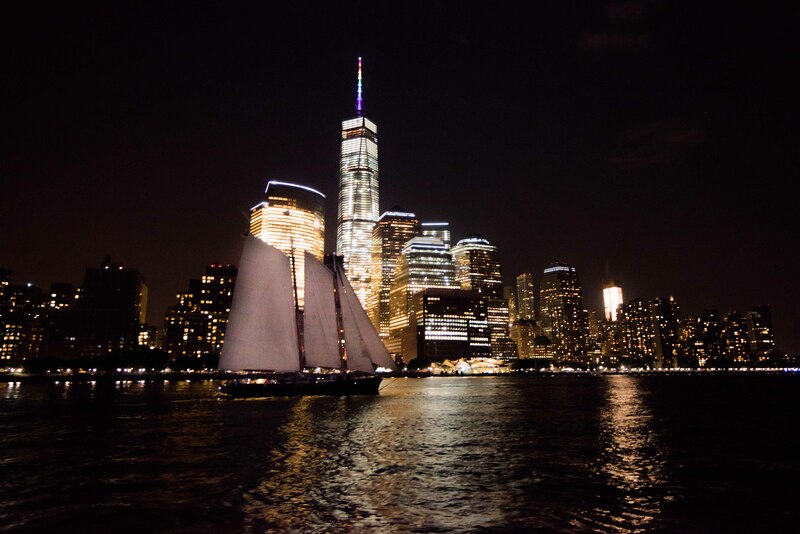 Join us for a magical, moonlit view of Manhattan aboard the Schooner America 2.0. On this sail, you will experience the splendor of New York City’s nighttime skyline under the bright, radiating moonlight. This light dinner sail features a most seaworthy cuisine: sushi, and not just any sushi, but Iron Chef Morimoto’s sushi! No sushi meal would be complete without sake, and this sail does not disappoint, we offer a range of cool, refreshing sake served on the decks of New York City’s most elegant schooner. The menu includes a sampling of sushi perfect for a one-of-a-kind sunset sail – 9 sushi pieces and 1 roll – served in 2 platings, paired with 4 sake flights, and all while we set sail for the New York Harbor! 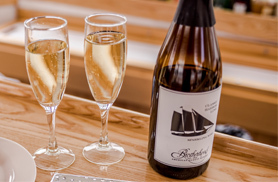 Start your Sunday off with a Mimosa Sail aboard the stunning Schooner America 2.0. Sit with friends and family and enjoy an early afternoon out on the water in NY Harbor. Offering a premium sailing experience, the Schooner America 2.0 is the newest, largest, most elegant sailing ship designed for our fleet. 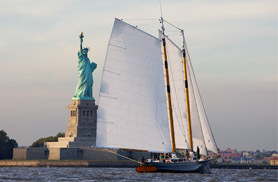 Added to our fleet in 2011, the America 2.0 provides the most exceptional day sailing one can find in New York Harbor. So sit back and relax for two hours on this classic yacht. Please join us for this special warm and cozy cruise with your friends, family, and all your loved ones during the Holiday Season. 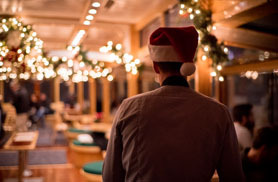 Step inside the toasty solarium in full holiday decor for a one hour and thirty minute cruise to see the New York City lights. Listen to Holiday Caroling backed by a live band and sing along to the classic holiday carols. One complimentary drink of Beer, Wine, Champagne or Delicious Hot Cocoa (Spiked if you please), Cookies, and treats for all our guests are included! (**Additional Drinks are available for purchase) This is a NYC Holiday cruise that you just can’t miss! Don’t let the cold scare you! 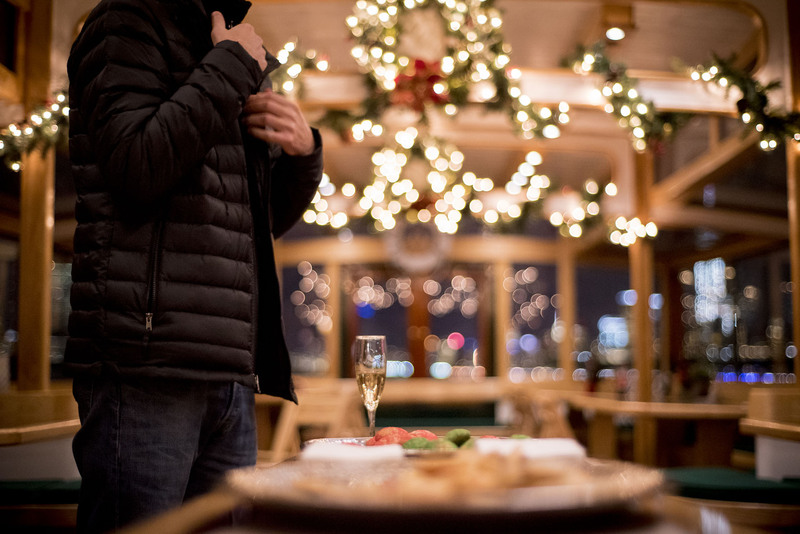 Step aboard one of our classic, climate controlled yachts, decked out in holiday decor and cruise with us into NY Harbor. 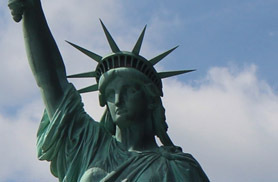 Take in the most famous skyline in the world and get an up close view of the Statue of Liberty. 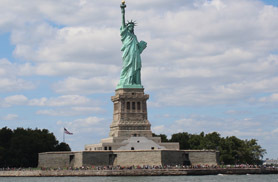 This is one of NYCs Best Sightseeing Cruises! Intimate and cozy, you are sure to enjoy your time out with us and make it a memorable experience. We offer one complimentary drink (additional drinks available for purchase). To read more about this cruise click to purchase. 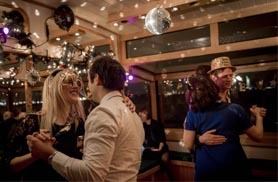 Step aboard our luxury Yacht Manhattan II in full holiday decor and join us for our romantic Holiday Jazz Cruise. Enjoy this 1.5 hour cruise with your loved one and a glass of Champagne in hand. 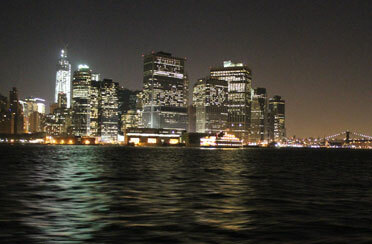 See the city lights twinkle at night as you cozy up for an evening out in NY Harbor aboard a luxury yacht. * Expect an elegant sophisticated evening, conversation-friendly seating and great sightseeing! * Roasted gourmet mushrooms with sage and thyme served with toasted baguette. * Sparkling wine bar: Our private labeled house sparkling Blanc de Blanc, Spanish Cava, French Cremant. * Soda, Water & Juices Bar also included. Step aboard the Yacht Manhattan or Manhattan II decked out in full holiday decor. Relax in our climate controlled glassed-in observatory and sip on wines hand picked by our adored wine expert Wendy Crispell! She will teach you which wines go perfectly with everything on your holiday table. Additionally, each will be paired with the perfect cheese, chocolate or chutney to help you build the perfect holiday platter, or to help bring you into the spirited holiday season. See the key NYC harbor sights in just one hour aboard the smaller more intimate wooden yachts of the Classic Harbor Line fleet and depart from North Cove Marina. This yacht is ideal for up to 40 guests, feature full bar, comfortable seating and excellent views of the city skyline and New York harbor. Each excursion will feature a slow pass by the Statue of Liberty & Ellis Island. On occasion, at high tide, we may even circumnavigate the Liberty Island. This shorter cruise is ideal for families or tourists with limited time. 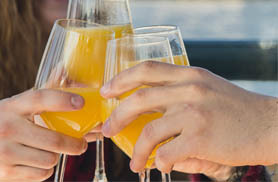 Start your mid afternoon with us for a Mimosa Cruise out to the Statue of Liberty! 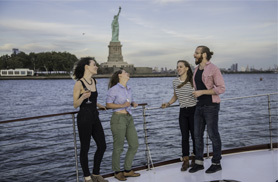 Experience New York like you never have before aboard one of our classic yachts. 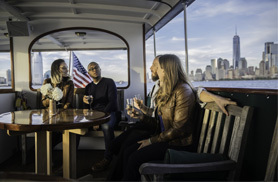 After a morning of sightseeing in the Financial District leave the noise of city street life behind and join us in NY Harbor for a sightseeing boat tour. Sit back, soak in the sun and enjoy the luxurious view of the island from the comfort of our open decks of one of these classic yachts! 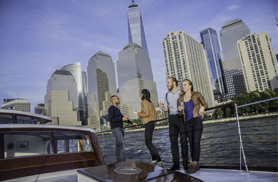 Join us aboard yacht Kingston from our North Cove location for a sunset cruise in NY Harbor. 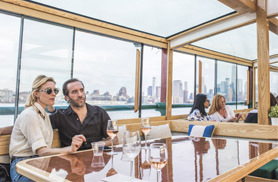 The yacht is ideal for up to 32 guests, features a full bar, comfortable seating and excellent views of the city skyline and New York harbor. Each excursion will feature a slow pass by the Statue of Liberty & Ellis Island. On occasion, at high tide, we may even circumnavigate the Liberty Island. 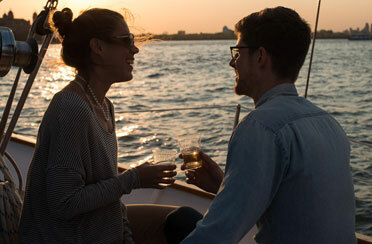 Join us in NYC for a Champagne Valentine’s Day Cruise aboard the luxury yacht Manhattan II. As you cruise on the Yacht Manhattan II, you will be able to take in all the beauty the New York City skyline has to offer while cozying up and staying warm in our climate controlled observatory. 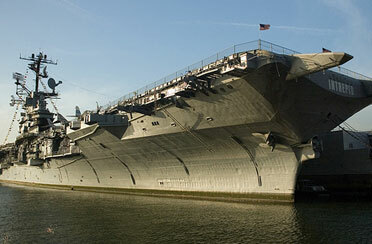 This cruise has limited capacity to create an intimate, comfortable and quiet NY Harbor cruise. 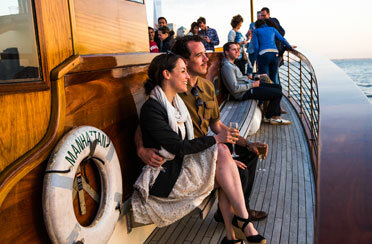 This Valentine’s Day Cruise is one of the best date ideas in the city of Manhattan. This romantic, intimate and breathtaking NYC Cruise is something that you will make a regular annual event on this special day. Join us this St. Patrick’s Day for an Around Manhattan Brunch Cruise! Upon boarding, hear the majestic sounds of a Celtic bagpipe. Playing from the bow of the boat, and bringing you to the far off hills of Ireland. Once you step aboard, enjoy a four-course Irish-themed brunch menu. Listen to the cheerful stylings of a live Irish fiddler playing throughout your journey. There will be a slow pass by Ellis Island, where nearly ¼ of all immigrants who passed through, were of Irish decent. (3.5 million!) So step aboard and join us for this magical cruise. Looking for a unique gift to give your friend or loved one? Classic Harbor Line has a variety of cruises that will make the most perfect gift. Have a specific date you would like to join us for a date night, Anniversary, or Birthday? Check out our online calendar. Take to the water and fall in love all over again. Copyright © 2019 Classic Harbor Line Chelsea Piers, Suite 103 New York, NY 10011 Powered by PRI.